$0.99 (regularly $2.99) 5/20/2016 - 6/30/2016! Problem Child takes you inside the hyperactive and somewhat Machiavellian mind of Robb Lightfoot, the kid who had his own special, reserved seat in the principal's office. He wasn't looking for trouble, it just found him. He was president and sole member of Highland Elementary's short-lived rock-throwing club, a chewing gum connoisseur, and woodshop survivee. Robb's recollections are part truth and part tall tales. Learn why school is unlike Jeopardy! and why too much knowledge may be hazardous to your health. Some of these tales happened almost exactly as written, others are a combination of pranks, misunderstandings, and mishaps that have been combined. Still others are epic stories that have grown with each telling, and form a part of the Lightfoot's family lore. A key point in these stories is that usually, Robb is trying to do the right thing and getting it all wrong. His allies are a patient principal, a tolerant mother, and neighbors who have their own quirks. The stories cover Robb's grade school years, and include a cast of his friends. Just like in the TV Show Dragnet, the names have been changed to protect the innocent. 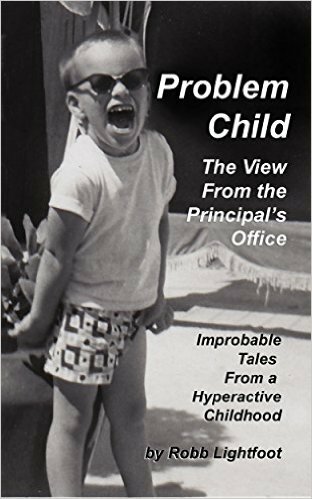 Problem Child is dedicated to the late Principal Tom Lewis, who eventually set up an extra desk in his outer office for Robb to take his time outs, reflect, and read. Author Robb Lightfoot went on to complete his studies and enter education as a profession. He now lives, teaches, and writes in Northern California, and owes a great deal to the very patient faculty and staff at Highland Elementary in Oildale.